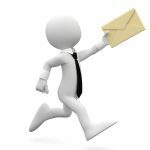 We can provide you with a competitive stamped concrete quote from our database of paving installation companies around the UK. 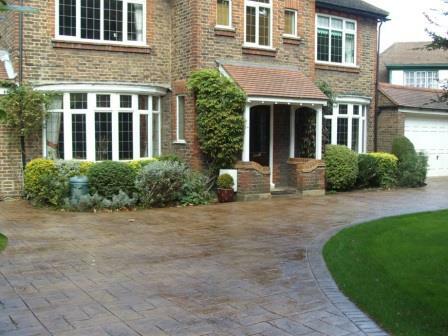 Whether you are looking for a new stamped concrete driveway, patio or footpath this service is absolutely FREE. 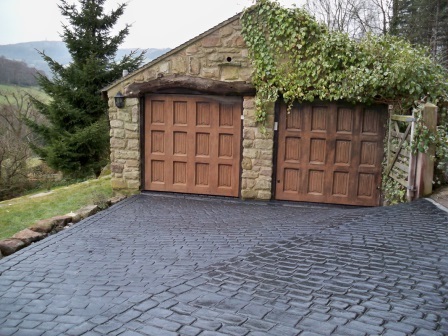 Stamped Concrete is coloured and formed concrete with the intention of replicating natural paving materials such as sandstone, limestone, slate, granite setts and cobbles. It originated in North America where it is also known as pressed concrete but it in the UK it is referred to a Pattern Imprinted Concrete. The textured and coloured surface of stamped concrete is available in a wide range of colours and patterns to suit any homeowner’s driveway or patio area. Installing Stamped Concrete is not a DIY job. The art and science of creating a realistic impression of natural paving to make stamped concrete realistic, relies on many factors. Your stamped concrete quote should detail which colours and patterns are to be used and driveways look more realistic with a cobble or brick effect border as natural stone paving would have. The effect of natural stone paving in stamped concrete is achieved by adding coloured pigments to the surface of the still damp concrete and pressing printing mats into it. This creates indentations in the concrete which resemble the joints and textures of natural stone paving. Stamped Concrete will have a more realistic appearance if the combination of patterns and colour combinations are chosen to match a type of natural stone paving material which exists in nature. Any stamped concrete quote should include a scale drawing of the site, detailed information regarding the patterns and colours to be used and an explanation of the installation process. Your existing driveway should be excavated to a depth of at least 200 mm to allow for the sub-base and concrete, each at least 100 mm thick. Excavation would normally be carried out with a mini-digger and if so, attention must be paid to the position of any underground pipes and cables. 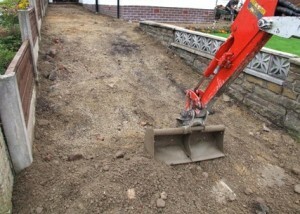 Once the driveway has been excavated, shuttering, or formwork should be firmly fixed in place to outline the area of the new driveway. Timber boards held into place with pegs are normally used for the straight edges of your new driveway but where curves are introduced, flexible uPVC boards work best. 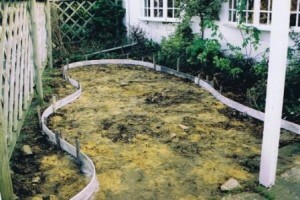 At this stage soakaways, gullies and drainage systems should be installed. At least 100 mm of Type 1 MOT should be compacted down to form a firm sub-base for the stamped concrete. This should be flat but with falls following the contours of the land to enable surface rainwater to run off the stamped concrete surface and into drainage channels. 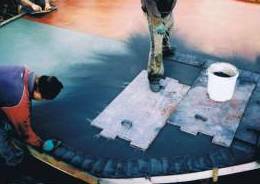 Stamped Concrete is far stronger than ordinary concrete if best industry practice is followed. 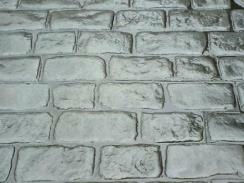 This is due mainly to the use of colour surface hardener which adds more cement to the wearing surface of the concrete. It is also down to the fact that the more experienced and professional installers will use fibrous concrete rather than an ordinary concrete mix. 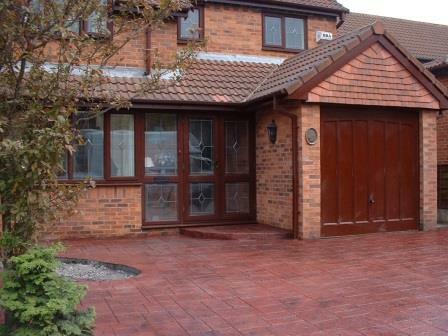 It is always worth checking your stamped concrete quote for the concrete specification your installer intends to use. 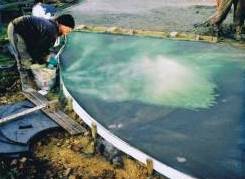 Once the concrete has been delivered it should be levelled with a magnesium float and colour surface hardener scattered over the surface. 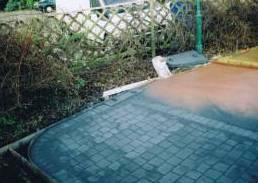 Enough colour surface hardener should be applied to ensure that all surface water is absorbed and the colour is consistent across the concrete. A large blue steel trowel is then used to press the powdered pigment into the concrete and close the surface. Coloured antique release agent powder is then applied to the surface with a soft brush. This is normally a complimentary colour, which when the printing mats are pressed into the concrete, emphasises the joints and textured marking on the stamped concrete. 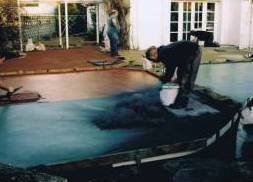 Printing mats are pressed, or ‘stamped’ into the concrete to create the desired natural paving pattern. Hence the name stamped concrete or pressed concrete as used more commonly in America. Printing mats are available as solid mats and flexible mats, and they have the reverse pattern of the paving finish you have chosen. The coloured and patterned concrete is now allowed to harden before crack control joints are cut into the surface. Concrete has a natural tendency to crack as it contracts and if left to its own devices will crack at the points of most pressure. These are normally at the internal corners of the concrete (i.e. external corners of your house) or in the centre of large slabs but your stamped concrete quote should outline where they will be and why. Crack control joints allow the installer to predetermine where cracks will occur, that is, under the crack control joint cut where it will not be seen. Now the stamped concrete surface can be cleaned with a power wash and once dry it is protected with microporous acrylic sealant. 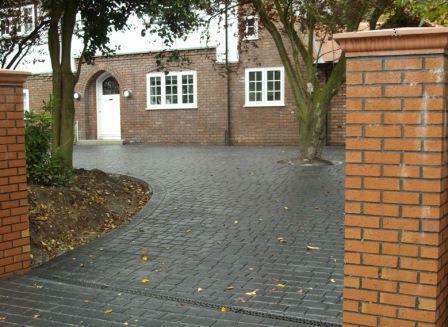 This forms a protective coating for the concrete and enhances its colour. For the first few weeks the newly sealed stamped concrete will have a shiny surface but this will mellow with time. Finally, crack control joints should be sealed with a bead of silicone sealant and manhole covers checked to ensure that they are not stuck down with excess concrete.